The long-term goal of the restoration process is an unimpaired functioning ecosystem in which viable populations of native species are maintained. This includes not only oaks, but associated tree species, as well as an understory of native herbaceous savanna plants with occasional native shrubs. Also, a range of ages in the oaks is desirable, thus ensuring continued integrity of the savanna ecosystem. 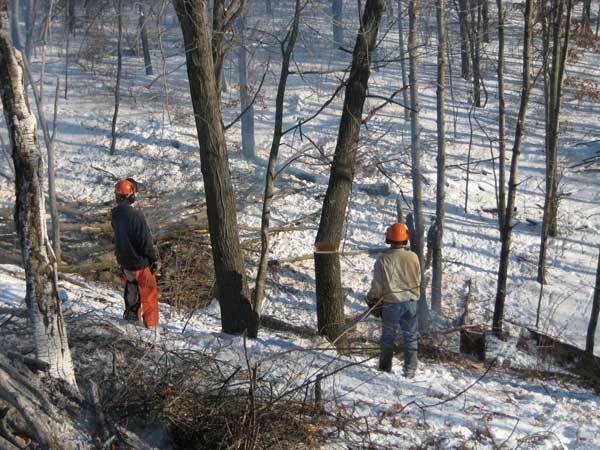 Much of the initial tree removal work can be carried out in parallel with brush removal. 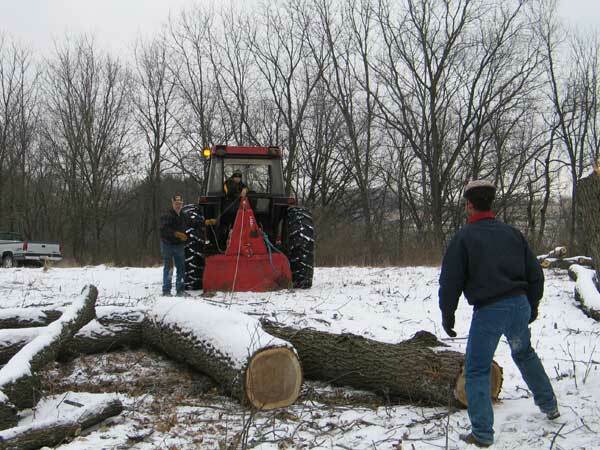 The cut brush provides an excellent base for the burn pile that is an essential part of the tree removal process. All cut stumps (both trees and brush) must be treated with herbicide, generally Garlon 3A 15% in water) or Garlon 4 20% in oil, to prevent resprouts. Glyphosate can also be used, at 50% dilution in water. Always add a dye to the herbicide mixture so that crew members will know that cut stumps have been treated. It is essential to treat the stumps soon after cutting to be certain that they are not missed. Tree removal is a slow and expensive operation. A lot depends on the initial quality of the site, the terrain, and its access. 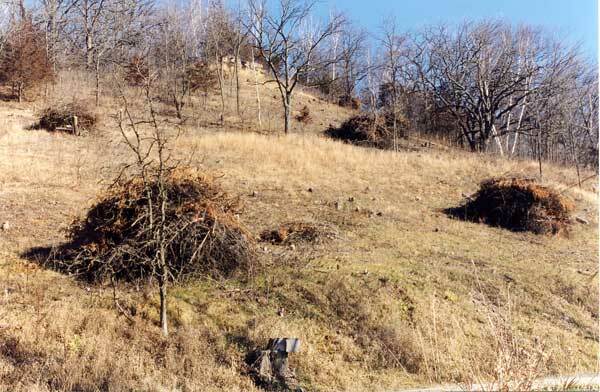 The time required for the complete cutting and cleaning a savanna site in southern Wisconsin on fairly difficult terrain varied between 100 and 200 person-hours per acre. · The ideal time to clear an area is winter, when the ground is frozen hard and there is (at least a light) snow on the ground. Under these conditions, the soil is not disturbed and (depending on slope) a truck (1/2 to 3/4 ton) can be driven off-road to pick up cut wood. Also, burn piles can be used without danger of fire getting out of control. Depending on the location, there may be two or three months of suitable conditions. Clean-up and some other less impactful parts of the job could be done at other times of the year. · Select a site (5 acres or less) to be restored. This is a site with large open-grown oaks. It should also be a site with good access (so that firewood or saw logs can be brought out). · Ideally, the land manager (who does not do any cutting) should be on site, at least at the beginning of the work, and preferably daily when major tree cutting is in progress. · Survey the site and mark trees, either those to be saved or those to be cut. Marking trees to be saved is preferable. Be sure everyone on the crew understands the markings! · Select sites for burn piles. These should be in open areas, so that flames do not affect nearby branches of important trees. Make sure there is enough open space for the anticipated size of the pile(s). If there is no snow on the ground, use a leaf blower to clear a wide fuel-free zone around the pile. · Start a burn pile. To do this, collect downed timber and standing dead trees or shrubs, getting enough fuel to start the fire. Start the fire with drip torch fuel (diesel or kerosene could also be used). The fire will be maintained by further cutting. 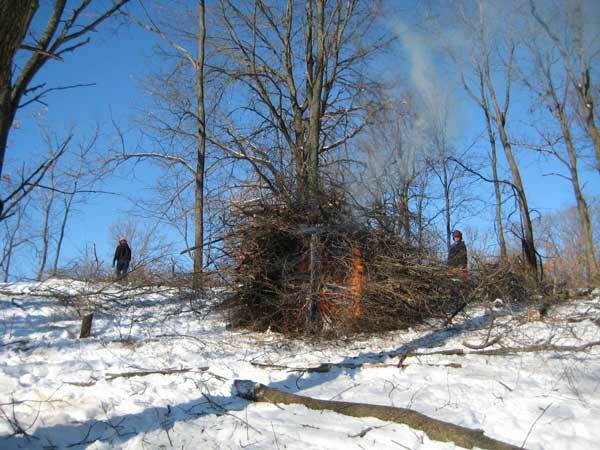 Keep the burn pile compact by trimming side branches before throwing them on the pile. The branches and logs should be laid on the burn pile in parallel fashion to ensure a good burn. In a well-built burn pile, the fire will be easy to start and to maintain. In a large site, more than one burn pile should be made. Burn piles should be preferably 100 feet apart. 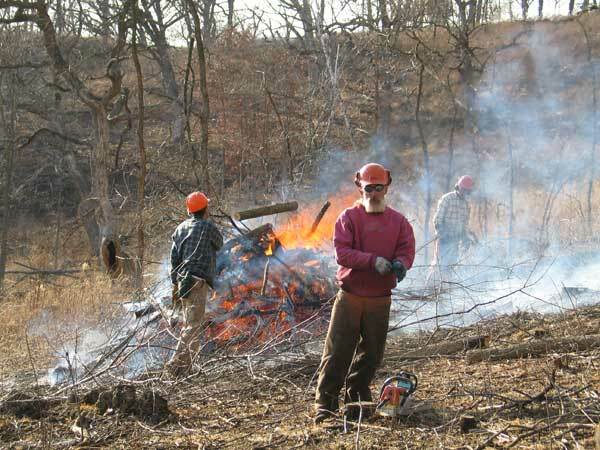 · While the burn pile is being established, other crew members can start on the trees. Here is the procedure used by an experienced crew leader. “We had only one person cutting down trees. It is important to cut down the trees one at a time. Cut down one tree and put it on the burn pile before cutting down the next. This is actually quicker than cutting down several trees at once. This is because cleaning up several trees on the ground is much slower. The downed tree is cut into pieces (chunks) that are large but small enough to be dragged by a single person to the burn pile. Once at the burn pile another person with a chain saw cuts the tree chunks into pieces of appropriate size to be placed on the burn pile. A third person puts the pieces on the pile. This description calls for 4 people. If the trees are small, two people can be cutting trees, as long as the two crews are far enough apart so as to not interfere with one another. Two people to drag each tree chunk and one or two people to cut the chunks into pieces for the pile. It is important that the pieces are placed in parallel on the pile so that they burn quickly.” Willis Brown, CEO of Michler & Brown LLC. · Make sure that when the tree falls it does not damage any protected oaks. Cut the small branches into size to throw on the burn pile. If the tree is to become firewood, cut the bole into segments short enough to lift into a truck or leave for cutting by a cooperator who has agreed to remove the fire wood. For saw logs, cut in 8 foot or larger segments. Mark these saw logs and leave in place for later skidding to a nearby road. · Crew size: Four is the minimum. Six is preferable. · Important! Do not try to drag large cut trees or logs long distances! Bring the crew to the trees. If the work is done when the ground is frozen, the soil will not be disturbed. The goal of savanna restoration is to create an open tree canopy (10-50% cover). The goal of tree removal is not to generate trees for market, but to restore the land to its former state. Although it may be possible to have some economic return from the cut trees, this should only be done if it can be ensured that damage to the habitat will not occur. Loggers operate with a different rationale than restoration ecologists. Slash that a logger might leave is often not compatible with the restoration process and logging trucks may damage fragile topsoil layers. Removal of woody plants is best done in the winter, preferably when there is snow on the ground. Selection of personnel is important. The workers should be able to identify the various tree species in winter and should be careful when felling trees to be certain that they will not damage nearby trees that are to remain. Although wheeled vehicles are essential for tree bole removal, they should only be permitted when the ground is frozen solid (preferably with some snow cover). If firewood removal is not to occur, the logs must be cut in lengths short enough for a single person to place them on the fire. Unless the crew is very experienced, the land manager should be on site when tree cutting is being carried out to monitor the process. Once a tree is cut it is gone forever! Nicely cleared slope with scattered brush piles. They will be burned on snow. Although this is a mainly a prairie remnant, the same principles apply. to a tree that is also to be cut down. done, only scattered open-grown oaks will be left. Low impact skidding of large walnut saw logs. This tractor can haul three logs at a time. Much faster than a horse or oxen!